Restored vintage Vespas lambretta Scooters from ClassicalWheels. We specialize in Quality restoration and sales of Vespa Piaggio and Lambretta Italian scooters. We are the full- time, professionally trained team that specializes in rotisserie restoration and service of classic scooters. With years of experience on Italian scooters, our mechanics restore them from ground up while keeping original look and operation. We take the scooters down to bare metal and inspect and restore everything from component level up to the final assembly. Every component of the scooter is visually inspected and tested to our high standards. With our high standards and factory specifications from our engineers, our scooters are rebuilt to ride and show like new. We have a large number of finished scooters in house and huge quantity of un-restored scooters standing by for custom restoration. 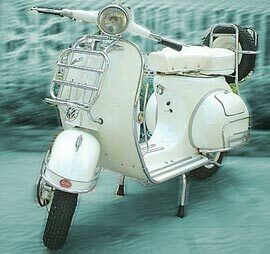 We can do custom colors and modifications by request, check out our on-line Restored Vintage / Classic Vespa Catalog . Other custom options are available upon request for an additional charge. Please contact our Customer Assistance for any questions.